We received an email response from County Executive Ike Leggett of Montgomery County, Maryland regarding our campaign. 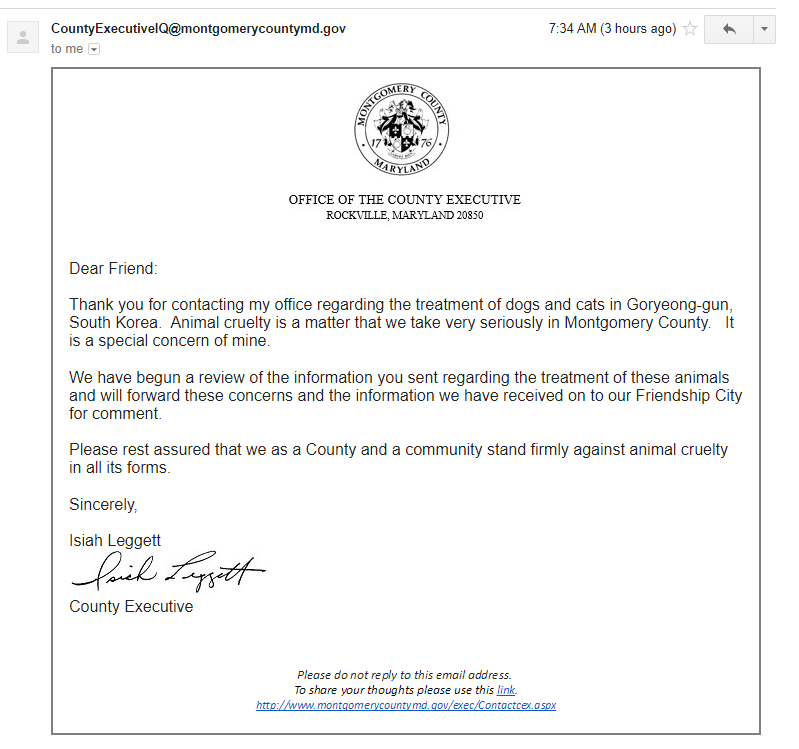 We had asked Montgomery County to take action against the dog meat trade in Goryeong-gun, South Korea. We are grateful to Mr. Leggett for responding to our concern so quickly and for supporting our campaign. He informed us that they have begun a review of the information we sent regarding the treatment of these animals and will forward their concerns and the information they have received to their Friendship City for comment. Mr. Leggett also kindly informed us that they, “as a County and a community, stand firmly against animal cruelty in all its forms.” We are appreciative of Mr. Leggett’s leadership in speaking out against the cruelty of the illegal dog and cat industry in Korea and look forward to receiving an update from his organization after they receive a response from Goryeong-gun. Please send a letter thanking County Executive Leggett for responding to our concern and for his support of our campaign. You can use our suggested message below or your own words. We thank you for responding to our concerns raised via the recent petition on Change.org about the mistreatment, torture, and consumption of companion animals in Montgomery County’s Friendship City, Goryeong-gun in South Korea. And we thank you for taking action by contacting Goryeong-gun for a comment. Both domestic and international pressure on this issue is required if we are going to incite some real change in South Korea, so I kindly urge you reach out to Goryeong-gun until affirmative action has been taken by their authorities to end the horrific and illegal practice of the dog and cat meat trade for good. GOOD PERSON TO KNOW THAT THIS IS UNACCEPTABLE TO DO TO DOGS AND CATS FOR FOOD NOW. Please end this cruelty. Dogs are needed for the sick and for bringing joy to people. They are not food. Cats are not food. They’re family members. Korean dog and cat meat traders treat those animals in the most heartbreaking way. It’s barbaric. It’s evil. This is so demonic your country looks like an ugly hell camp to me. UNCIVILIZED monsters. Eating dogsisso wrong. Greedy evil monsters is how most people see you.